A scholarship from the Adelaide Summer Research Scheme (ASRS) provides endless opportunities which are empowering and rewarding, according to one of last year’s recipients, Jacob Whitelock. We sat down with Jacob to learn why he applied for the scholarships and what opportunities have arisen from his project; Digital Duvivier: a Computational Analysis of Cahiers du Cinema and Positif Film Reviews. Jacob Whitelock had the opportunity to immerse himself in a new technology during his project. 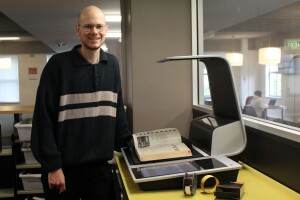 Part of my research involved working with microfilm archives from the 1950s and 60s in the Barr Smith Library. I had never even heard of microfilm before, so it was rewarding to immerse myself in a technology before it is phased out entirely by digitisation. It introduced me to a new way of researching that was a lot more hands on than the digital research that I usually do in coursework. All of the materials I used in this project were written in French, so it was great for my continuing study of the language. The nature of the research required that I not only read a set of film critiques, but go deeper into the way theses reviews were written and the result that they had upon public opinion in France. It was great for my skills in critical reading and interpretation, which was especially helpful in the lead up to Honours. My ASRS has become part of a larger ongoing project, which I have been invited to continue at the end of this academic year. So, not only will this project result in an academic article, it has also provided me an opportunity for ongoing work in research with the department beyond the scholarship period. If you are at all interested in research in the future, or if you want to develop your skills further, it is a wonderful opportunity to engage deeply with a project and with a member of academic staff. It will likely introduce you to new skills and ways of studying that are not usually a part of undergraduate coursework. The nature of the ASRS is more independent, empowering and rewarding than coursework as you are working toward a goal that does not revolve around grades.